In Glasgow every fireman had a whistle and the firemen sitting on the off side of the appliance would blow their whistles, then they would rest and the firemen on the near side of the appliance would blow their whistles and so on. When bells came into use in Glasgow they replaced whistles. The Fire Services National Benevolent Fund (The Ben Fund) was formed on the 17th of August 1943. 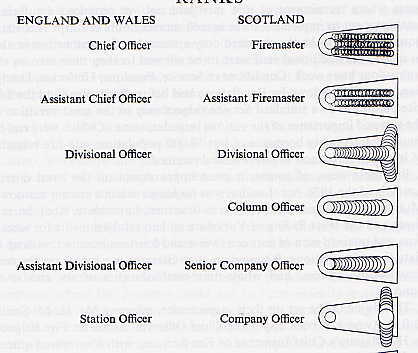 Fire Services (Nomenclature) (Scotland) Regulations, 1954. These regulations came into operation on the 23rd December, 1954. They took effect in the Western Area Fire Brigade on the 31st January, 1955 as instructed in General Order No. 154. The existing ranks in the Brigade were substituted with the corresponding ranks of the Fire Service in England and Wales. The changes did not involve changes in rank and helmet markings except in the case of Column Officers who now wear the markings appropriate to a Divisional Officer. September 1973. A review of the ranks structure would take place with, for the first time, ranks being equated to responsibilities, and also the introduction of the SDO rank. 31st May, 1963 Glasgow Fire Service implemented the reduction of the working week for operational personnel from Station Officer to Firemen from 56 hours per week to the 48 hour week Duty System. Later in the year they reduced the hours of Senior Operational Officers on the Residential Tour of Duty from 120 hours to 96 hours. January 1974. The 48 hour week arrived. January 1980. 42 hour week.